Oh man oh man oh man. Do I have a goodie for you today. So firstly, disclaimer: this gorgeous dinner isn’t exactly my brain child. It’s from this cookbook called Vancouver Eats, given to me by the husband of one of my favourite people, who obviously married a food-obsessed man just to please me. This foodie husband named Taylor knows the way not only to Jen’s heart but also mine, and loves to give me delicious presents from his travels and also fabulous cookbooks that he not so subtly reminds me are “gifts for the both of us.” This book in particular is a celebration of some pretty spectacular recipes from our fair city’s best restaurants, and I am obsessively going through it and cooking everything. I of course encourage you to purchase the book yourself because all of the food is so show-offy and rad, and I’m pretty confident that these two recipes I’m sharing will entice you to bite the bullet and purchase anyway. Don’t be intimidated in the least: beef medallions are just a fancy term for smaller, thinner beef tenderloin steaks, and risotto is just about the easiest thing you can make if you have any leftover patience (lol). I’ve modified this to include some easier-to-find store-bought ingredients and tweaked it to my tastes because I am controlling. Pair this with a cab sauv or your favourite hearty red and prepare to swoon. Start the sauce for the steak. Melt 2 tbsp of butter in a large deep skillet over medium heat. Cook the shallots for 5 minutes until soft. Add the mushrooms and cook for about 15 minutes, stirring every once in awhile, until they’re golden brown and the liquid has evaporated. Salt and pepper the mixture. (Always wait to salt your mushrooms until they’ve cooked awhile; salting them too early makes them rubbery). Pour in the brandy. Take the pan off the heat and use a long bbq lighter to light the mixture on fire, letting the flame burn out. This cooks off the alcohol and makes the whole thing less boozy (the only time you will ever hear me refer to that as a good thing). Add the beef broth or stock and return the pan to the heat. Cook over medium heat, simmering it away, for about an hour, until only around a cup of liquid remains. Add the cream and simmer a further 15 minutes until it’s nice and thick, seasoning with more salt and pepper if it needs it. Add the thyme leaves at the very end. When the sauce has been working for about 30 minutes, start the risotto. Pour the broth or stock into a pot over medium heat to warm it up. Heat another pan over medium heat and cook the diced bacon for about 15 minutes until it’s nice and crispy. Remove it with a slotted spoon to a paper towel-lined plate and set aside. Add the leeks to the bacon fat in the pan with 1 tbsp of butter and cook for another 15 minutes until lovely and soft. Season with pepper and a little bit of salt, and remove with a slotted spoon to the plate with the reserved bacon. Add the olive oil to that same pan and sauté the chopped onion for about 5 minutes until softened. Add the rice and stir, toasting it for a few minutes. Pour in the wine and give it another good stir as the rice absorbs the liquid. For the next 25 minutes or so, have the patience of a saint and slowly add a ladle or two of broth/stock into the pan every few minutes, stirring as you go, until all of the liquid has been cooked into the rice and it’s nice and tender but still has a tiny bit of bite to it. Sometimes it takes a little longer than 25 minutes, sometimes a little less. Risotto is bit of a high maintenance diva but she’s worth it. Stir in the reserved bacon and leeks in the last ten minutes or so to warm them up. Take the risotto off the heat and stir in the parmesan and remaining butter. Season with salt and pepper to taste. When your risotto is doing it’s thing for about 15 minutes, start your medallions. Cut each filet into thirds and, using a meat mallet or the back of a heavy pan, pound them to about a half inch thick. Season them well with salt and pepper. Heat a heavy bottomed skillet (I like to use my cast iron skillet for steak) over high heat. Add 3 tbsp of butter to the hot pan and sear half medallions to how you like them, about 1 minute per side for medium-rare. Repeat with the remaining butter and remaining medallions. Let the meat rest for 5 minutes before serving. I’m still floored by you posting regularily. This does look amazing. Might have to pick up that cookbook. This looks good! After I do some research on how to seat meat (to avoid the chicken debacle from last week), I’ll try it out! Yay for more posts!!! Thanks. This reminded me of a family favorite I recently shared with my Mom – it bridged her dementia. 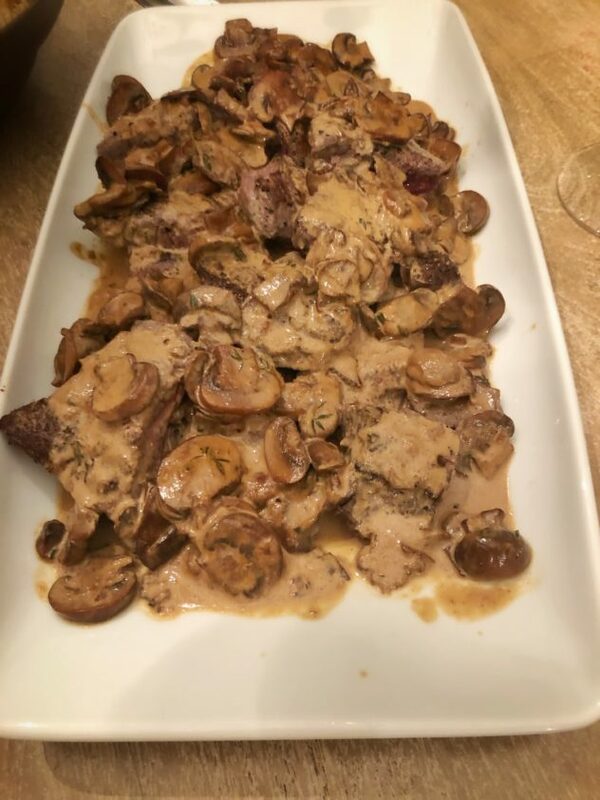 Can’t beat mushrooms, wine, shallots & cream for a great sauce! But a question: When you instruct to cut each filet into thirds, I first imagined slicing the hockey pucks horizontally, but then there would be no need to pound them to half inch thickness (at least for the cuts available in San Diego). Did you cut wedges, then pound? And yes, I’m gonna buy the cookbook. Love Vancouver. YUMMMM! The photo & description alone has made so hungry…I’d pass on the appetizer, salad, wine, & desert for this meal. Sorry I must have gone a little crazy…there must be a glass of wine to go along with this dish. Friend- this recipe is ah-mazing! And I would gently suggest pressure cooking that risotto. Seriously, a pressure cooker will change your risotto game for life! No more patience of a Saint B.S. 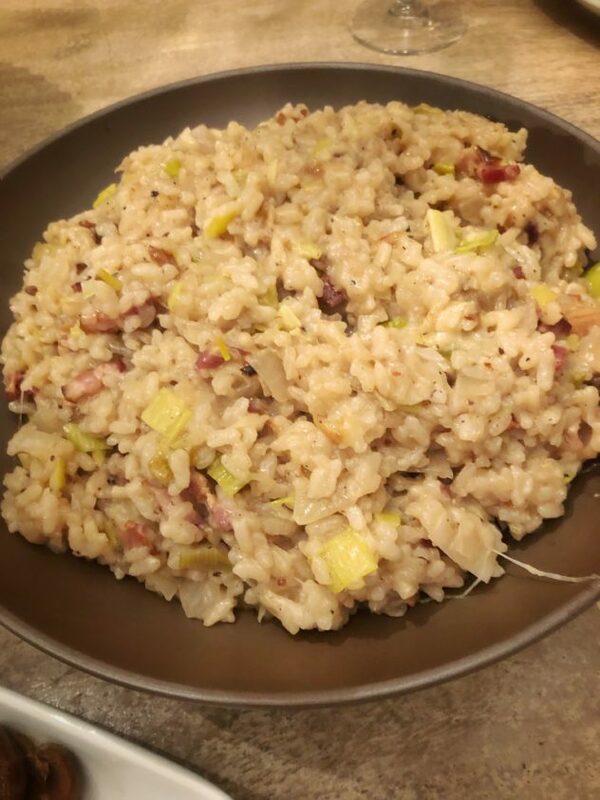 Just perfect risotto, every time, in 8 -10 minutes.